Searching for a wedding venue near the Yarra in Melbourne? Are you looking for a wedding venue near the water in Melbourne, but haven’t found quite what you’re looking for yet? Have you considered Sketch? So, it’s not strictly riverside as it’s more harbourside but it ticks all the other boxes! Located in Docklands in the one of the old warehouses the venue has a historic looking exterior but a very sleek and modern looking interior, kitted out in black and featuring an audio visual system that is sure to keep all the nerds happy. The big ‘reveal’ with the panoramic windows out to the water and Bolte Bridge behind at the start of the night is always pretty impressive too. Now, you know how I like to road test the food for you? (I’m selfless like that!) Well, I’m pleased to report that it’s brilliant. I’m not a restaurant critic so I won’t bore you with a Masterchef style review, but suffice to say it was delicious and there was plenty of it. I sat with the wedding band on this particular night and they were full to bursting by the end – and those musos can eat! 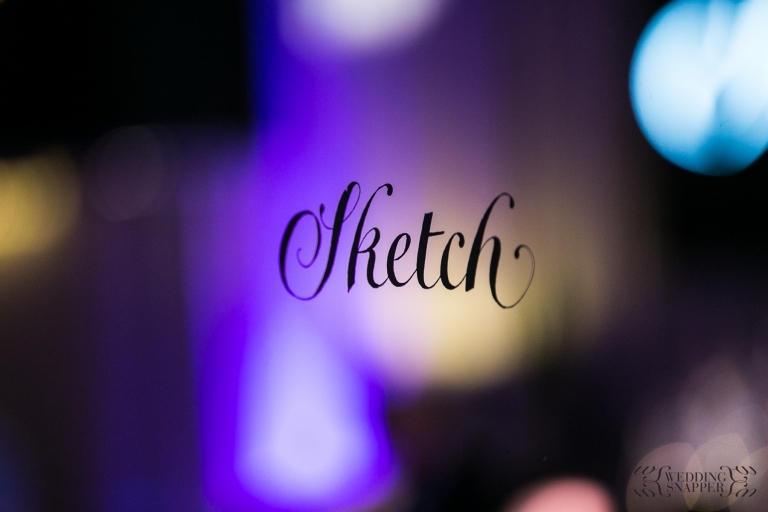 Add Sketch to your venue shortlist and then scamper on over to our recommended wedding venues in Melbourne page for a few more suggestions. Click here to chat about your Melbourne wedding photography plans.